Frogs are amphibians, meaning that they spend part of their lives in the water and part of their lives on land. Typically frogs begin life as totally aquatic tadpoles, living only in the water and breathing through gills. They then undergo a complete metamorphosis, developing legs and lungs and moving onto the land, though water will continue to be important in their lives. Tadpoles hatch from eggs laid by adult frogs in ponds, lakes, slow-moving creeks or other relatively calm water sources. At the start, a male frog grips the female around the waist; he fertilizes the eggs as she lays them in strings or clusters held together by a jelly-like substance. Some frogs attach their eggs to underwater plants, stones, sticks or other solid objects, while others let the eggs float freely in the water. Depending on the species, the parents may provide some care of the eggs or simply abandon them once they’re laid. The amount of time it takes for frog eggs to hatch varies greatly by species, but generally the tadpoles will emerge anywhere from six days to three weeks after the eggs are laid. Although the tiny tadpoles will eventually become air-breathing frogs, the creatures that emerge at first look more like tiny fish than anything that might ever walk on land. The newly-hatched tadpoles consist of a tail, a rudimentary set of gills and a mouth. The gills may be visible on the outside of the tadpole’s head during the first few days after hatching. New tadpoles still have some of the egg attached to them, and it nourishes them as they adapt to their environment. The first thing tadpoles do after they hatch is to seek out the shelter of underwater plants such as cattails, weeds or grass. They secrete a sticky substance that lets them attach themselves to one of these plants where they will remain for a week or more, eating algae or bits of the host plant. Only when they’re ready to move on do tadpoles break free of their host plant and begin to swim about. 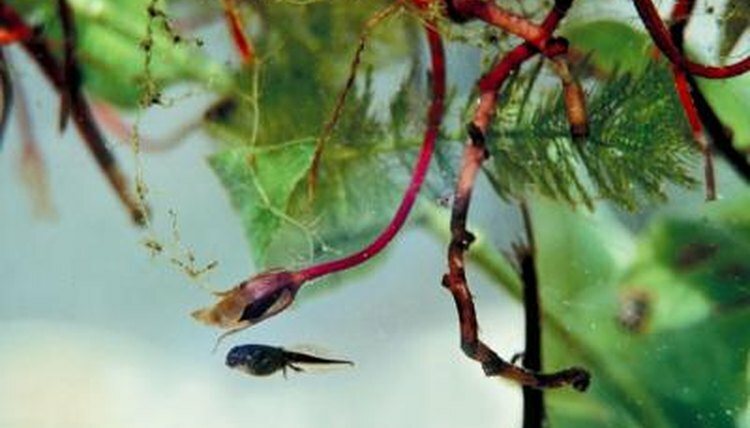 Once tadpoles have lost their egg sacks completely, they consist mostly of a bulbous head and a long tail, with very little else in the way of visible features. These little amphibians come in a range of colors such as green, black or speckled, depending on what species they are. Size, too, depends on the species, with small frogs generally producing small tadpoles and large frogs, such as bullfrogs, having large tadpoles. As the tadpoles begin to mature, they will start to develop legs and bigger bodies, and at the same time their tails will shrink until they become frogs.